Did the brothers ever get the message? We are not told, for that is the question the parable leaves us to answer. Each of us will write our own ending to the story. The sin of Dives in its root is unbelief: hard-hearted contempt of the poor, luxurious squandering on self, are only the forms which his sin assumes. The seat of the disease is within; these are but the running sores which witness for the inward plague. He who believes not in an invisible world of righteousness and truth and spiritual joy, must place his hope in things which he sees, which he can handle, and taste, and smell. It is not of the essence of the matter, whether he hoards [like the rich fool, 12:16–21] or squanders [like the prodigal son, 15:11–32]: in either case he puts his trust in the world. Act 3 – The Dialogues. 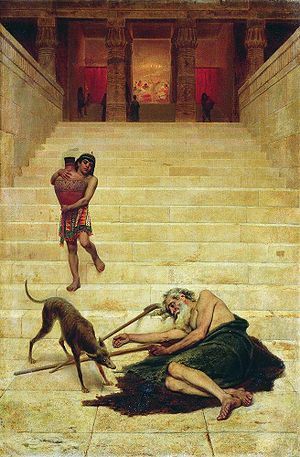 To a first century hearer of the parable, the fates of the two would have been surprising for it went against the grain of the common wisdom: blessings in this life were a sign of God’s favor while illness, poverty, and hardship were a sign of God’s curses. Yet the one well “blessed” in his lifetime is now tormented in the netherworld (see the Note on 16:23 below) where he can see Lazarus and Abraham across the great chasm that divides them (v.26). 22 When the poor man died, he was carried away by angels to the bosom of Abraham. The rich man also died and was buried, 23 and from the netherworld, where he was in torment, he raised his eyes and saw Abraham far off and Lazarus at his side. 19 “There was a rich man who dressed in purple garments and fine linen and dined sumptuously each day. 20 And lying at his door was a poor man named Lazarus, covered with sores, 21 who would gladly have eaten his fill of the scraps that fell from the rich man’s table. Dogs even used to come and lick his sores. The rich man “dined sumptuously each day” while Lazarus longed to eat what fell from the table, but can’t. The rich man lives a privileged life while Lazarus ebeblêto pros ton pulôna, literally, “had been thrown before the gate” of the rich man’s house.